"I will prevent disease whenever I can, for prevention is preferable to cure." 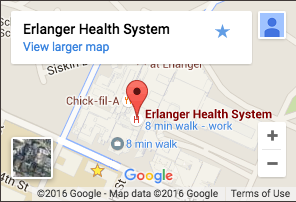 Helping people stay well is central to Erlanger’s core mission. To this end, our health system integrates the latest thinking in lifestyle and preventive medicine into all our medical service lines. For example, our Heart & Lung Institute not only includes world-renowned surgeons, but also one of the region’s only preventive cardiologists who helps patients stay heart-healthy through diet and exercise. Similarly, our oncology area complements the most advanced treatment technologies, with evidence-based lifestyle coaching to help patients live cancer-free. Importantly, our primary care practices serve as key points of wellness contact in the community, empowering patients with the latest information and techniques to stay healthy through all of life’s phases. Many of the above offerings are through the Chattanooga LifeStyle Center, which can help you achieve healthy lifestyle changes through evidence-based programs including cardiac rehabilitation, diabetes education, weight management, exercise/flexibility classes and much more. Search Erlanger's Classes & Events webpage for a complete list of our community offerings to help you live healthier, more vibrant life.